The 10 Best Speakeasies in Washington! The speakeasies of the past still have quite the influence on Washington State’s bar scene today. These dark and hidden spaces hold fascinating histories, some even dating back to the late 1800s. Serving up delicious food and time-honored cocktails, here are the best speakeasies in the state! No minors. No firearms. No reservations. Those are the requirements for entering the Bathtub Gin & Co. located in Seattle, Washington. Reminiscent of the speakeasies that operated during Prohibition, this wood and brick bar is in what used to be a boiler room. Now with tables and seating that ooze comfort and casual conversation, you can order a classic cocktail or have one designed on the spot by the very capable bartenders. Either way, it’ll go down smooth and easy. Open every night from 5 p.m. until 2 a.m.
With a meaning that’s associated with being brave and unruly and an interior that evokes memories of the speakeasies that were popular secret places during Prohibition, El Gaucho is a dimly lit bar that allows you to experience elegance in a whole new way. From the shadowy light of the candles to the music coming from the ivory keys of the piano, you’ll know you’re in for a special evening from the moment you enter. With signature appetizers, fresh seafood and aged Angus beef to fill your belly, you’ll have your choice of house-made cocktails like a Victorian Sunset made with Crown Royal, Solerno, Blood Orange Liqueur, sweet vermouth, and orange bitters or the Gaucho Cosmo, a triple berry-infused vodka with triple sec, cranberry juice, and sweet and sour mix. Happy hour starts in the bar at 4 p.m. every night. Tavern Law is like no other bar you’ve ever visited. One of Seattle’s most unique and historic places, you’ll find plated comfort food like Smoky mac & cheese, oysters with mignonette and lemon, foie gras mousse made with apple wine and smoked apple butter on toast, and a chocolate fudge cake to die for. But you won’t find a written list of adult beverages here at Needle & Thread, the upstairs and hidden speakeasy of the main tavern. With the push of a button, you’ll enter another world of bespoken cocktails and the celebration of life. If you’ve never experienced natural selection in bartending, a visit here is a must. Closed on Mondays, it’s always a good idea to make a reservation. Spirits of the past will be your companion when you visit Dillinger’s Cocktails and Kitchen in Olympia, Washington. Spirits as in the adult beverage kind, that is. Located in one of the city’s oldest buildings, Dillinger’s will transport you back in time and awaken your mind to the past, the present, and the future of specialty crafted cocktails. Dillinger’s has been a hot topic in numerous publications including South Sound Magazine, Trip Advisor, Thurston Talk, and several social media sites because they raise the bar with the swanky environment and the talk-of-the-town drinks like the Veijo Verde, known as a smoky margarita. Open every day and live music on Mondays. Durkin’s Liquor Bar in Spokane, Washington, is a new establishment that offers old-fashioned drinks and designer cocktails with a speakeasy vibe. You have your choice of non-traditional bar food like rabbit, pork chops with pickled apples and brussels sprouts, and a fried bologna sandwich with French fries, and when it comes to the drink, you have not one, but two separate bars. The upstairs bar features drinks like Grandma Agnes, a vodka, pickle brine, and Vermouth beverage, and the downstairs bar offers Death in the Afternoon, made of Herbsaint, sugar, and dry champagne. Open every day but Sunday, you’ll never tire of what you’ll find at Durkin’s Liquor Bar. With a cocktail selection that seems unending, the Knee High Stocking in Seattle, Washington, almost defies description. With an atmosphere that mimics the illicit establishments that sold alcohol during Prohibition, this little unmarked corner of the building where you press the buzzer to gain entrance has served more than 500,000 people since 2017. Not only will you find the cocktails, wine, and other libations of superior quality, you’ll enjoy pairing them with the Filipino-American cuisine for which the bar has become known. Good food. Good people. Great drinks. Club Crow Bar & Grill in Cashmere, Washington, is a surprising little bar with a lot going on. There’s something every night from comedy to themed parties to live music, and you’ll always have something to enjoy. 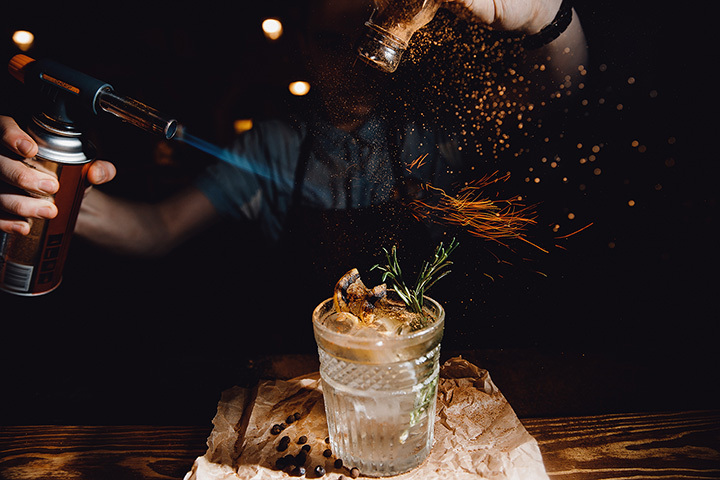 The speakeasy vibe is perfect for this retro-styled establishment and you can get drinks like the Double Dog Dare and Snailbones. Open till 2 a.m. every night. Looking for a fun night out with friends? The Tin Lizzie Lounge in the Queen Anne area of Seattle is the perfect place. Named for the Model T Ford because the building originally was home to the workers of the nearby Ford assembly plant in the early 1900s, you’ll find this to be a cozy retro bar with the flavor of a Prohibition-era speakeasy. Drink specials are offered every day along with live music and other fun events during the month. Happy hour is 3 p.m. to 6 p.m. Monday through Friday. En Rama isn’t your typical speakeasy. Located in Tacoma, Washington, the irony of where it’s located is that it’s inside an old-fashioned government building. If you want to know what makes a bar noteworthy, it’s the bartenders who work there. And the bartenders at En Rama know their job. They can make spot-on pairings for drinks and food just by listening to the feedback offered by customers. Closed on Sunday and Monday, happy hour is from 4 p.m. to 6 p.m. every night.